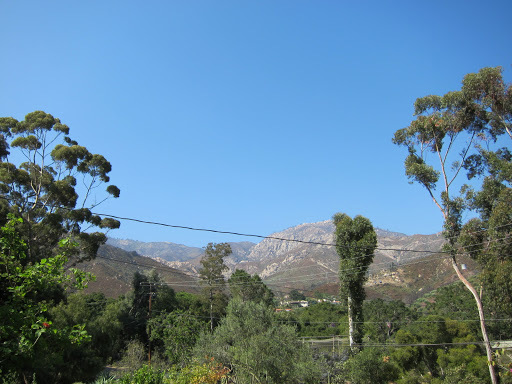 In my attempt to invoke spaciousness and balance in my life, to invite happiness beyond anything I have imagined before, I find myself in living in a little zen sanctuary studio for a few weeks in the canyons above Santa Barbara. Biking is my solitary mode of transportation. What I eat, how I plan the day, all of it has changed living up up up a hill. I don’t know if I feel like I am in a dream, or the last few years in New York were a dream, but the contrast feels so stark it must be one or the other, as I am on a technological (internet was out for a week) and dietary detox (eating fresh local organic berries, peaches, bok choy, green beans, melon, oh my). I can’t imagine that I will be able to get back on the subway earnestly, after knowing the sweet rush of a downhill ride on a foggy morning, or the slow climb on the lowest gear under the hot sun. I love that the distance between my place of work and my temporary home is the same, but getting shorter everyday. There are so many delicious smells to breathe in and different trees/plants to notice that I am more enamored each day. Nor did I know that I didn’t know that I love the quiet darkness of the night so much, or the simple music of the birds every morning.